AT&T(s t) said on Wednesday it will spend $14 billion in boosting its wireless and wireline networks with $8 billion in expanding its LTE network. The carrier expects to cover 300 million people by the end of 2014 using new small cell technology and distributed antennas. The expansion will help support not only the mobile business, but also AT&T’s decision to abandon its old-school telephone network and rely on LTE instead. 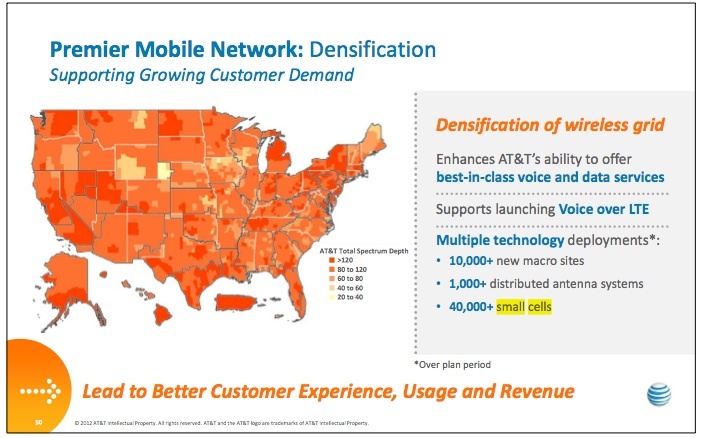 Thus, the announcement that AT&T will use small cells to build out density is important, because it will allow more subscribers to take advantage of the limited airwaves, and is yet another carrier commitment to the HetNet concept. This idea combines the use of multiple radio technologies –from LTE to Wi-Fi — as well as a variety of different base stations and antennas to maximize the capacity of the airwaves, and is the next generation of cellular infrastructure. In addition to its cell towers, AT&T said it will use more than 1,000 distributed antenna systems. DAS setups take the capacity of a single cell and distribute it among numerous antennas, allowing a carrier to shape cellular coverage within or around buildings rather than just blast bandwidth out from up on high. AT&T will also use more than 40,000 small cells to build out a highly dense network that can reuse spectrum and hopefully move traffic off the airwaves and on to AT&T’s fiber networks. The initial deployments of these dense networks will begin in the first quarter of next year and will work with the 3G UMTS and HSPA+ networks that AT&T has deployed. By 2014 AT&T will support LTE on these small cells as well. Both Verizon(s vz) and Sprint(s s) are already exploring similar plans to make their networks more dense using small cells as well.